Annie Louisa Cocker was born on 27 Jun 1886 in Lower Barrington, Tasmania, died on 7 Sep 1929 at home, Lower Barrington, Tasmania at age 43, and was buried in Barrington, Tasmania. Annie married Malcolm Samuel Moore, son of James Jessop Mawer and Isabella Findlay, on 28 Apr 1908 in Methodist Church Lower Barrington. 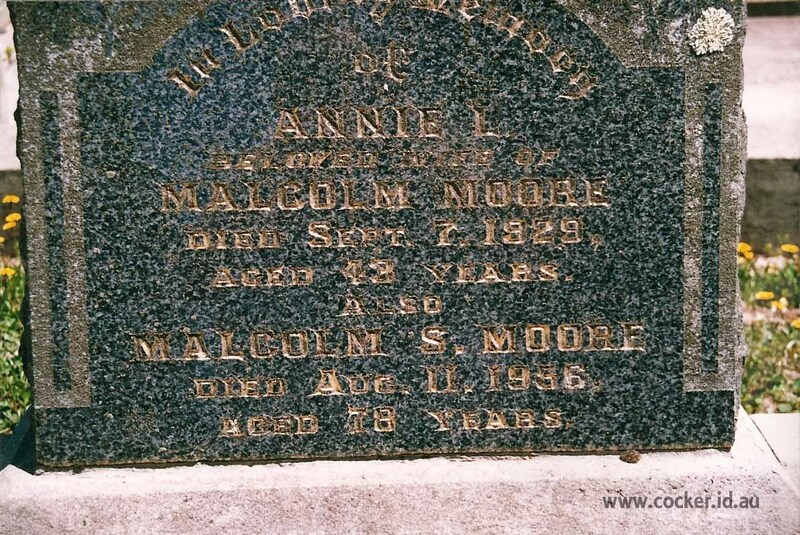 Malcolm was born on 17 Dec 1877 in Northdown and died on 11 Aug 1956 at age 78. James Jessop Moore was the grandson of convict John Arnold Mawer. The marriage of Miss Annie L. Cocker, daughter of Mr John Cocker, to Mr Malcolm S. Moore, was celebrated at the residence of her parents' -by Rev. J. C. Freeman oh Wednesday, before a large assembly of relatives and friends. The bride wore a pretty gown of grey, trimmed with silk, lace, and insertion, and carried a shower bouquet of lovely white flowers and ferns. The bridesmaids were Misses Amy Cocker and Flossie Jago. They were dressed in frocks of blue and cream, and wore the bridegroom's gift of greenstone brooches, set in gold, and carrying floral baskets. Mr A. E. Cocker acted as best man. The ceremony was held on the verandah, and after the usual formalities were signed, the company sat down to the breakfast in a large marquee adjoining the house. After the banquet, toasts appropriate to the occasion were proposed. Mr and Mrs Moore subsequently left for Victoria on their honeymoon. MOORE.-On the 7th September, at her residence, Lower Barrington, Annie Louisa, beloved wife of Malcolm S. Moore, and fourth daughter of John and the late Rebecca Cocker. aged 43 years. At patient sufferer at rest. FUNERAL NOTICES MOORE.--The funeral of the late Annie Louisa Moore will leave her late residence, Lower Barrington, on Monday, September 9th, at 3 p.m., for the Barrington cemetery.-ROBSON, Undertaker, 'phone 28 Sheffield. 4-John Jessop Moore was born on 10 Jun 1909 in Barrington, Tasmania and died on 21 May 1938 at age 28. 4-Annie Irene Moore was born on 19 Nov 1910 in Lower Barrington, Tasmania. 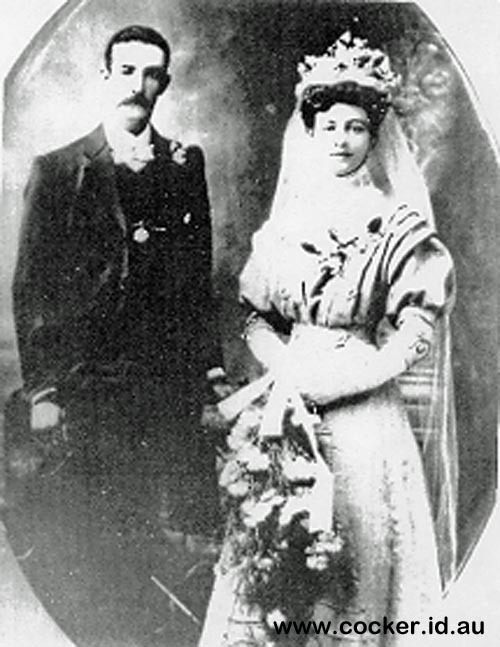 Annie married Robert Eeles, son of George Eeles and Ada Selena Williams. Robert was born on 24 Oct 1900 in Nook. They had two children: Ella Jo and Ruth. 5-Ella Jo Eeles was born about 1934. Ella married Michael Finlay. Ella next married John Nutting. 5-Ruth Eeles was born about 1937 and died about 1945 aged about 8. Annie next married Reginald Edward Collins, son of Edward Collins and Catherine Lawler. Reginald was born on 15 Apr 1914 in Queenstown, Tasmania, Australia. They had six children: Edward John, Malcolm Leslie, David Allan, Robin Geoffrey, Dorothy Joy and Christopher Robin. 5-Edward John Collins. Edward married Sally Eeles. 5-Malcolm Leslie Collins. Malcolm married Steffie Miller. 5-David Allan Collins was born on 16 Oct 1946 in Queenstown, Tasmania, Australia. David married Claire Dalton. 5-Dorothy Joy Collins. Dorothy married Garry Speedy. They had two children: Robin and Rebecca. 4-Malcolm Clarence Moore was born on 25 Feb 1912 in Lower Barrington, Tasmania. Malcolm married Joyce Page. They had four children: Annette Lorraine, Edward, Malcom Samuel and Margaret. 5-Annette Lorraine Moore. Annette married Werner Berger. They had two children: Jason and Monica. 5-Edward Moore. Edward married Robyn Douglas. They had three children: Karrina, Simon and Nathan. 5-Malcom Samuel Moore. Malcom married Robin Hortle. They had two children: Joshua and Kriston. 5-Margaret Moore. Margaret married Peter Mitchell. They had three children: Katharine, Christine and Anore. 4-Frank Reginald Moore was born in 1913 in Lower Barrington, Tasmania and died on 12 Apr 1994 at age 81. 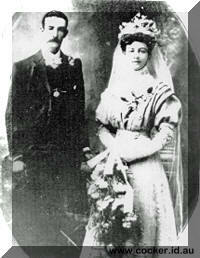 Frank married his second cousin Joyce Lesley Bennett, daughter of Edwin Leslie Bennett and Grace Melvina Keep. Joyce was born on 1 Jul 1917 in Latrobe and died on 27 Jul 1996 in Burnie, Tasmania, Australia at age 79. They had eight children: John Leslie, Enid Ruth, Shirley Ann, Heather June, Rita Francis, Robyn Joy, Peter Brian and Ian Timothy. Frank next married Betty Irene Weeks (Nee Foster). Betty was born on 20 Aug 1930 in Latrobe and died on 6 Jun 2009 in Launceston at age 78. 4-Christina Maria Moore was born on 4 Jan 1915 in Lower Barrington, Tasmania and died on 24 Oct 1966 in Devonport at age 51. Christina married Maurice Wesley Campbell Allison, son of Robert Allison and Elizabeth Duke, on 26 Jun 1937 in Sheffield. Maurice was born on 13 Jan 1903 in Lower Barrington, Tasmania and died on 24 Dec 1966 in Latrobe, Tasmania at age 63. They had three children: Lyall, Neil and Tony. 5-Neil Allison. Neil married Helen. 5-Tony Allison was born in 1941 and died in 1942 at age 1.